Although I have seen Petals on the Wind categorized as being a ‘gothic horror’, I don’t really consider the book to be a horror novel at all. I only reviewed it for this site because it is a continuation of the story started in Virginia Andrew’s first novel, Flowers in the Attic. I also get the impression that the next book in the series, If There Be Thorns, is quite a dark story. 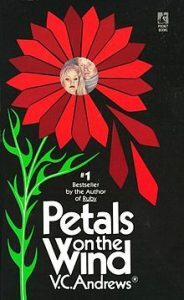 Petals on the Wind picks up the story exactly where Flowers in the Attic left it and once again the story is written in the first person and told from Cathy’s viewpoint. The three surviving Dollanganger children, freshly escaped from the confines of their grandmother’s attic, are on a bus and headed for sunny Florida. After so long shut away from the world some sunlight would probably do them all the world of good, but the surviving twin, Carrie, is unwell and starts to throw up in the bus. Some of the passengers are less than sympathetic for the poor, sick child and it looks likely that the miserable, Sunday-hating driver will put them off the bus. Then fate steps in to lend a helping hand and a huge, black lady strides up the aisle and comes to the children’s aid. Her name is Henrietta Beech and the size of her heart is as mammoth as the rest of her body. Maybe even more so. Henrietta is a mute, but introduces herself to the children by writing them a note. She also provides Cathy with some rags to clean up some of the mess with. And when the driver of the bus starts complaining Henrietta writes him a note as well, informing him of exactly what will happen to a Sunday-hating driver if he throws a little sick girl off the bus. The upshot of this is that the driver detours the bus and drops the children off outside Henrietta’s home. The best thing about all of this is that the big, black lady with the heart of gold lives with a very good doctor. She is his housekeeper and Doctor Paul Sheffield is not only a good doctor, but a good man who wants to help the children. Sheffield takes the children into his home and into his heart, helping Chris to achieve his dream of becoming a doctor, helping Cathy to be the ballerina that she always wanted to be, and nursing Carrie back to health. Although the effects of the poison fed to her by her mother prevent her from ever growing to a normal height. Petals on the Wind is 410 pages long and continues the children’s story well into their adult lives. It is quite a story as well and sees many a man falling prey to the charms of the beautiful Cathy, including her benefactor Paul Sheffield. Paul is 25 years her senior and he tries to be just a father to her, but Cathy, like her mother, wields a power over men and in the end Paul succumbs to her charms. Cathy really does love Paul and she does not see the age difference as being a problem, she also sees a romance with Paul as being a good way of forcing her brother Chris to find someone else, other than her, to love— even though, in her heart, her love for her brother is not entirely sisterly. Chris’ obsession with Cathy remains constant though, no matter who she is with and it is a passion that was forged by the unnatural circumstances forced upon him while living in the attic. Apart from his unusual devotion to his sister, Chris tries to live a normal life. Cathy however wants vengeance on their mother and keeps a track of Corrine’s movements . And all the while Cathy is planning her revenge on both her mother and her grandmother. While I was reading Petals on the Wind I couldn’t help but notice that in some ways Cathy is very like the mother she hates. She knows what she wants, she expects to get it, and she will not let anything or anybody get in her way. With Cathy the big thing is vengeance, while with her mother it is money. Cathy is not as wicked as her mother, but she is, I thought, a bird of similar feathers and the sad thing is that if it was not for Cathy’s wish for vengeance certain bad situations might have been avoided and some of the characters would not die. But what is a story without conflict? As I stated at the beginning of this review, I do not really consider Petals in the Wind to be a horror novel. It has its darker moments of course, but so do most stories. If you are a hardened horror fan, this book is probably not going to be for you, unless, like me, you have already read Flowers in the Attic and are curious to see what happens next. If this is the case read away, because a lot happens next and it is rather interesting.